Stand out in these unique, feminine, and soft black mesh drape pants. Feature: YA #YJ0819 PANTS ONLY $9.70 FOR SET; $4.85 separately. 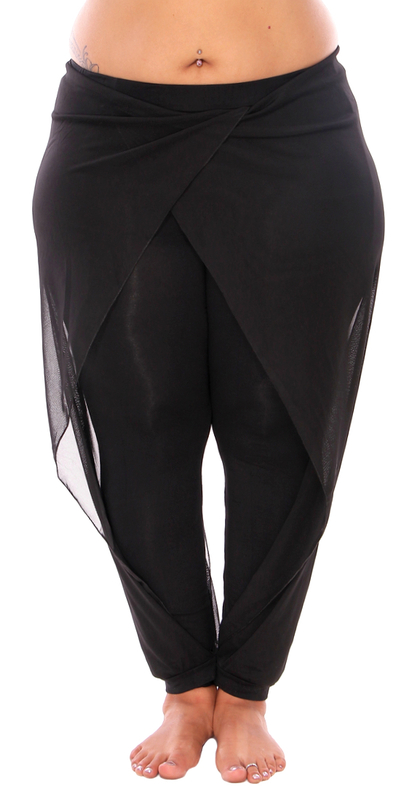 Stand out in these unique, feminine, and soft black mesh drape pants. Perfect for class or casual wear, they can be dressed up for performance too. Pants made of soft rayon jersey stretch fabric; mesh draping made of soft stretch polyester mesh. S/M/L/XL/2X U.S. Women's Standard sizes 8 - 20. Waistband / Upper hip: 30 - 44 inches; Lower hip: 36 - 50 inches; Inseam: 29 inches; Outseam: 38 inches.